When the Stokowski Society were choosing recordings for their two final releases in conjunction with Cala Records, this recording of Tchaikovsky's Symphony No. 5, described by the Society's Edward Johnson as "one of the best-sounding of the 1950s "his Symphony Orchestra" RCA recordings which he made with his specially-selected band of top-flight New York musicians", narrowly missed out in favour of a 1947 recording of Dvorák's Symphony from the New World. No doubt that had that series continued (the Dvorák was the penultimate collaboration between the Stokowski Society, currently being wound up after 30 years' existence, and Cala) this particular recording would shortly have seen a release there. As it is, we are delighted to be able to offer not only this wonderful recording, in a vibrant new XR-remastered transfer, but also a collection of Stokowski's encore pieces never previously issued in any digital format. These works highlight the conductor's acclaimed brilliance as an orchestrator and arranger, with piano and vocal works from Tchaikovsky and Chopin among the highlights. A degree of investigation into the Ippolitov-Ivanov work In A Manger suggests that the Russian composer had actually provided an arrangement of a traditional Slavic Christmas Carol, and that what we hear in this incarnation is Stokowski's orchestral arrangement of a choral version of Ippolitov-Ivanov's orchestration! On the 7-inch EP from which this was taken, entitled Season's Greetings from Leopold Stokowski, the piece is entitled 'Russian Christmas Music' and credited as a Traditional composition - we have chosen to re-assign it to the composer whose name now normally stands alongside it, together with the title he gave it! Of particularly unusual interest is the penultimate selection, Strauss's Tales from the Vienna Wood, in a shortened version with an electric guitar section recorded separately on the same day as the orchestra and edited in to create the full release. The guitar has received electronic treatment to add echo effects and a sound which vaguely resembles a zither - it makes an appearance toward the start of the arrangement, and is never heard thereafter! Incidentally, these two 'abridged' Strauss waltzes were recorded with the NBC Symphony but issued as being by "Stokowski and his Symphony Orchestra". Longer versions recorded at the same sessions for an 'Extended Play' 45 rpm disc were correctly attributed to the NBC SO. As Edward Johnson notes with regard to his choices here, "the 8 "Encores" were chosen for their variety, and also because Stokowski invariably had at least one encore lined up for his concerts and sometimes several. This same formula has been adopted on this release, with all these little recordings now making their very first appearances on CD." At Pristine Audio we've been delighted to be able to work with Edward Johnson and the Stokowski Society, and look forward to a continued working relationship beyond the era of the Stokowski Society itself and Cala Records' Stokowski series. This CD is the first collaboration between Edward Johnson of the Stokowski Society and Pristine Audio. Previously, the Society arranged for reissues with Cala Records, but that association has ended. The material on this CD all derives from LPs and 45s in Edward Johnson’s collection. The results engineer Andrew Rose has achieved in remastering said material are little short of remarkable. I have several RCA Stokowski LPs from the early 1950s in my collection, but they sound nothing like this CD. Surface noise has been eliminated. There is some tape hiss in the Chopin, and two selections recorded in 1947 betray their probable origins in 78-rpm masters. The detail and balance in the Symphony surpass that in the later stereo recording by Stokowski for London Phase-4. This CD is further proof that, given the current state of remastering technology, a talented engineer can achieve better results from vinyl sources than a less talented one can from the master tapes. Tchaikovsky’s Fifth was a Stokowski warhorse. He recorded it on 78s in Philadelphia in 1934, followed by the present version in 1953, and finally the London recording from the 1960s. In recent years, a live stereo 1952 account from Detroit has surfaced, engineered by the legendary Bert Whyte of Everest fame. I have not heard the live CD. As exciting as the stereo account with the New Philharmonia is, that orchestra cannot match the beauty of tone mustered by the select group of New York players Stokowski led in 1953. Several are first-chair players from the New York Philharmonic: William Lincer, viola; Leonard Rose, cello; James Chambers, horn; and William Vacchiano, trumpet (Gerard Schwarz’s teacher). William Trampler also is in the viola section. A complete list of Stokowski’s section leaders is available on Pristine’s Web site. None of the recording venues for the CD are listed, but judging from the echo in the Symphony, it probably was recorded in Manhattan Center. When a veteran Philadelphia Orchestra player was interviewed about Toscanini’s performance of the Sixth Symphony by B. H. Haggin, the player replied that “Stokowski and Ormandy let it breathe more.” That is a very apt commentary on this CD of the Fifth. There is none of the pressure-cooker intensity of Svetlanov or Dorati. Rather, Stokowski makes exquisite use of rubato throughout the work. Nothing ever seems rushed. Even when the tempo almost comes to a crawl in the second movement, the pulse is always there. Not that this is a slow rendition. It is five minutes faster than Bernstein’s last recording. There are a few little idiosyncrasies and cuts along the way, but nothing like the wholesale reorchestration Stokowski perpetrated in his thrilling account of the Fourth with the American Symphony. He does make the pause before the final statement of the theme in the last movement as short as possible. In his New Philharmonia recording, he eliminates the pause altogether, creating momentary havoc. Also, that last recording rushes the Symphony’s final four chords. In 1953, they are presented in a stately manner. On a technical note, there is some minor tape flutter in the third movement that presumably could not be corrected. 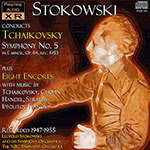 The eight encores, all arranged or orchestrated by Stokowski, have never appeared before on CD. Tchaikovsky’s Solitude is beautifully wistful, a reminder of Stokowski’s late-Romantic sensibility. The Humoresque offers perky wind colorings. If your previous experience of Stokowski’s Chopin is from his disappointing Houston Symphony recordings, the examples here will set you straight. The last prelude receives a rousing orchestration, brass to the fore. The Ippolitov-Ivanov is a lovely, lush piece. The Strauss waltzes, the only two selections featuring the NBC Symphony, are offered in shortened versions, aimed apparently at the Lawrence Welk crowd. Nevertheless, the vigor of Stokowski’s conception comes through. The zither in Tales from the Vienna Woods is replaced by an electric guitar, which does a credible job. Stokowski made a great recording of the complete waltz when he was 93, with the National Philharmonic for Pye. Oscar Levant has a great story about Stokowski and the Blue Danube in the first chapter of his first book, A Smattering of Ignorance. I would tell it to you, but I can’t match the master. This CD is urgently recommended. This article originally appeared in Issue 33:4 (Mar/Apr 2010) of Fanfare Magazine.